Making painfully slow progress on winter jobs though the new refrigerator counter top and cupboards are all but finished.. Started on the next job which is to replace the strips holding the covers over the cable wells in the ceiling. The starboard side has been a longstanding problem due to the leaks from the ventilators here. Decided that the plywood was so rotten that it should be replaced and as the join would be under the LED light panel would not show up. Of course once it was cut out it was all much worse than expected and we now have a much bigger job. I can't believe that my repair of the ventilator is still allowing it to leak but the wet insulation and soggy plywood appear to indicate that it is. Have left empty washing-up bowls under it and will see what they contain when I get back. Meanwhile on the cut there is a fishing competition. Now this has caused me quite a bit of entertainment, when we first moved onto the winter moorings, we had a letter from CRT asking us to leave at least 5 metres between each boat, to give room for anglers to well, angle. When I first arrived, I moored up in the dark but come daylight I was very pleased with the spot I had selected as it was under the power lines and had a bit more light than other places. I was a bit surprised when the next time I was on board, I found another boat moored almost touching me with overlapping warps and bags of other empty space where they could have moored. Next time I came down, [this was after the CRT edict about 5 metre distances] I found that they had moved 5 metres away from me. This would have been alright except that before they moved, they were well into the no fishing zone necessitated by the power cables, and so of no hazard to anglers. Their move put them into the fishing zone gobling up precious angling space. Of course they are not entirely to blame as CRT has gone to town with three notices in this area. 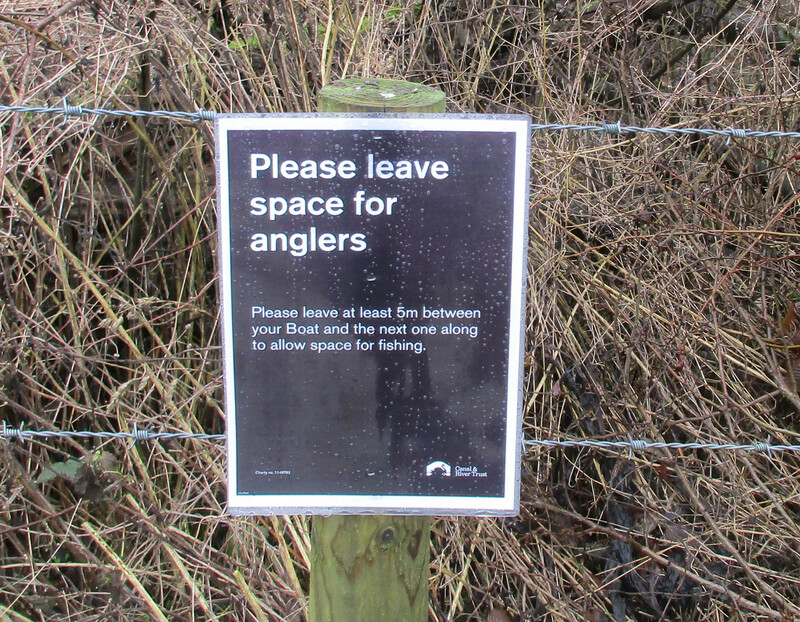 The first forbids angling, due to the power lines, the second designates this as a winter mooring location and the third asks boaters to leave 5 metres between boats to facilitate the anglers. The three notices: No fishing under the power lines, leave space for anglers and winter moorings. Please leave space for anglers even though they must not angle here. Cribbit and space for anglers where they may not angle.